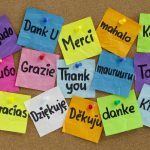 Question on LinkedIn: Receiving A Thank You – Does it really make an impact when a potential hire sends a post interview thank you note? What are your thoughts? – Well, after scrutinizing all recruitment processes, candidates are well recommended if we are writing post-interview thank you notes & agree that sending a thank you after an interview is appropriate and beneficial.because It provides another opportunity to differentiate yourself among other prospective candidates, which is the goal of any interview process. And also to demonstrate good manners and extend a professional courtesy, To show your appreciation for the interviewer’s time and interest etc…but remember if you were interviewed by multiple people, you want to show equal respect to all by sending individual notes to each. By ‘individual’, we mean make each note a little different from the others. If you write them all the same, they will lose their effect and genuineness. Also, be sure to get the correct name spelling and title of each interviewer. – It could if you were to accompany such message with (for example) some insights as to how you relate to the role. Most times you will evaluate the interview and come up with some more argumentation which would have helped you in the interview, so include this in the message. Anything which could help the hiring manager visualize you in this role will most likely support you, don’t send them a book but just a short message showing them you have understood the role and written as if you were already working there. – If you remembered something you had wanted to share or if you wanted to add clarity to a point that was discussed in the interview, it might put you in the forefront of the hiring manager’s mind as well as demonstrate self-motivation. And if it doesn’t, I believe it’s the correct way of doing business. – It is usually observed that candidates hesitate and feel shy to contact the interviewer, post their interview. Hence, a thank you note sent by the candidate could be seen as a sign of confidence and that the candidate is really willing to get this job. On the other hand, the day, which is yet to come, when sending a thank you note becomes a trend followed by every candidate, it should not be seen as a differentiator. – I prefer to see one. It gives me a bit more insight into the candidate, especially if it references items from the meeting. – I am the opposite of Ronni – most thanks yous come from Sales people and we tend to see the thank you as false – its actually just another way to get their name in front of you – which is fine as a sale technique but not what we look for from employees. We (HR and operational managers) tend to find them a switch off rather than something that gives them candidate an advantage. Its different if they send something that is in addition to the selection process and actually value and then ends with thanking you. – Candidates should always drop a thank you note after an informational or hiring interview. I recommend a handwritten note versus an emailed thank-you. It’s both professional and common curtosy. Sadly not everyone does this; ideally you want candidates that will be appreciative of peers and management. I think it comes down to value vs cost. Does it cost a lot to send these out? Sure. Is it a cost you can’t afford? Depends on the candidate. However, forget cost right now. Value. It brings a lot of value if the hiring manager reads it. Most won’t. But there’s a chance that the one that does ends up picking you over another candidate because of the letter. So you NEVER know. Same thing with cover letters. I never read them when I was recruiting…I was busy checking the resume right away. Some managers read them and other don’t. But you play the game. Your competition is sending out all these letters, so why aren’t you? That’s what I tell my clients. Today’s standards are to have a follow-up and cover letter. So do it. Play the game at 100%. Again, you never know who’s going to like to read those letters and it might be the differential for your new livelihood.